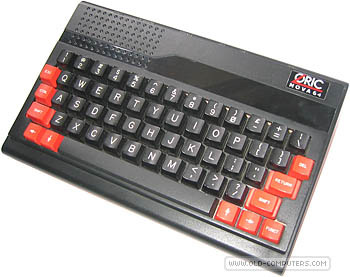 The NOVA 64 seems to be a legal copy of the Oric Atmos for the Yugoslavian market. "A Yugoslavian company (believed to be Avtotehna, based in Ljubljana) obtained a licence to make 5000 machines. Machines were made, but whether they were under license or not is not known in any detail. It is thought that they assembled parts shipped from the UK. I have a contact in Yugoslavia who says there were several in his village and about 30 in a school in the next village. This may suggest that more than 5000 were made. They were known as the Oric Nova 64 and were Atmos based." Thus, the NOVA 64 seems to be an exact Atmos machine, only the "NOVA 64" label being different. But we hadn't the chance to test one yet to confirm this statement. The motherboard however seems a bit different from well known Issue 3 & 4 ones used in most official Oric machines (RAM chips layout is different). The 64 in "Nova 64" comes from the fact the Atmos has really 64 KB RAM, but 16 KB are masked by the ROM at startup, thus leaving "only" 48 KB to work with the Basic language. Thanks to Ranko Vukcevic for the pictures. KEYBOARD QWERTY, mechanical keyboard, 58 keys. 4 arrow keys. ESC, CTRL, DEL, RETURN, SHIFT (x 2), FUNCT. see more Oric NOVA 64 Ebay auctions !